Colin Youngson has had the honour of being asked to carry the baton for two Commonwealth Games – 1970 and 2014. The situation was vastly different, the selection was stricter, more was required of the baton bearers and the publicity was much less. He has written of his experiences for the magazine of the Scottish Veteran Harriers Club and with his permission it is reproduced here. Instructions were strict. At all times runners must obey Police Officers! White shorts must be worn by all runners and escorts, though club vests may be worn! Girl Guides may wear uniform! On our section, we saw neither Police, Escorts nor Girl Guides! 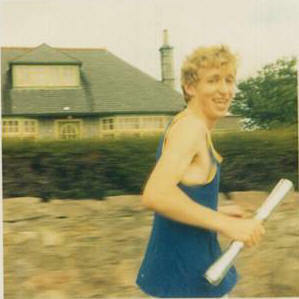 The Scottish Association of Boys’ Clubs organised the relay. Several formal letters were sent out to ensure it all went smoothly and to thank us afterwards. On Wednesday 15th July 1970, Aberdeen University Amateur Athletic Club runners were assigned a stretch from Holburn Street at Ruthrieston Road, past Aberdeen City Boundary to Balquharn Dairy, before Boys’ Brigade, Sea Cadets and Aberdeen AAC carried on to Montrose, en route for Meadowbank Stadium, Edinburgh on Thursday the 16th of July, when the Games were to open. I was 22 years young. We were to take over at precisely 14.16 hours and maintain seven-minute miles for five miles. Easy! Someone took eight photos of our participation. Bob Masson, Ian Hughes (the driver) and I posing in AUAAC gear, displaying a split-new Commonwealth Games kitbag. Taking over from stern-looking runners from a boxing club. Bob, Mike Partridge and I running along, brandishing the beautiful shining silver baton, a streamlined stylised thistle. Staging a hand-over at walking pace. Me grinning as I dodge up a side-street and pretend to abscond with the baton, unscrew it and steal the Queen’s message. Mike laughing as he watches me disappear off-route. More immature giggling as I pass the baton to him. After the next volunteers took over, the three of us (wearing regulation white shorts) getting our breath back while leaning on Ian’s car. If only all the relay runners had such fun! 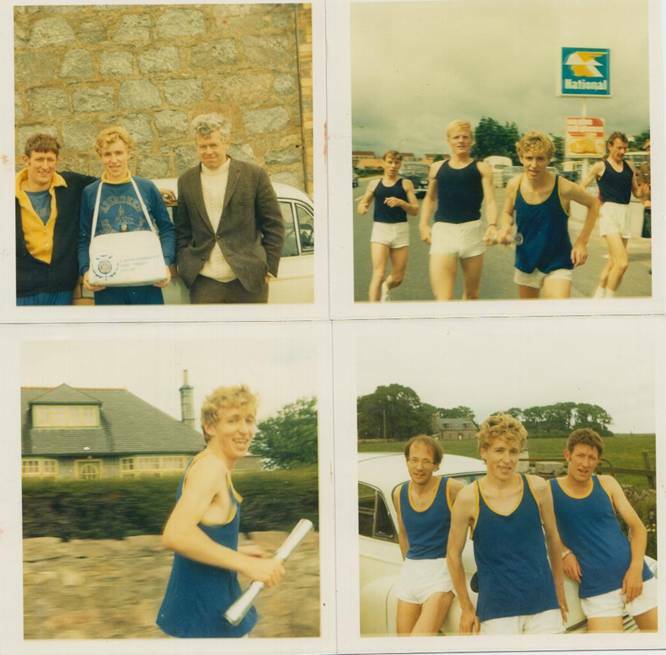 My friend Innis Mitchell tells me that he ran with the 1970 baton for Victoria Park AAC, along a remote stretch of road in the West of Scotland. Apparently the schedule was really demanding and he remembers that one of his faster team-mates suggested that a slower colleague should only be allowed to carry the baton very briefly indeed, in order to avoid the disgrace of arriving late for the handover to the next relay squad! Right after my relay contribution, in time to watch nearly all the athletics, Donald Ritchie and I travelled down from Aberdeen on the train and stayed with a former team-mate in the AU Hare & Hounds Club, Paul Binns, and his wife Ceri. They lived in Corstorphine, so Donald and I took the bus right across the Edinburgh to Meadowbank every day. I have a first-day cover with the three ‘British Commonwealth Games’ stamps, featuring running, swimming and cycling. My cheap camera took only three action photos of the Commonwealth Games athletics: a distant shot of some race; Mike Bull’s winning pole vault; and the joyously chaotic closing ceremony, when athletes of all nations mingled and celebrated together. All the way round the track, spectators could get very close to the action. Tickets were inexpensive and we could often get into the grandstand. I do not remember any officious types or security killjoys. Every day, fresh programmes in booklet form were on sale. I still have three and must have seen lots of events, since the results are handwritten. Most Scottish fans had the same highlights. Lachie Stewart’s victory in the 10,000 metres [as the last lap bell rang, I just knew that his famous (only in Scotland!) fast finish would ensure a gold medal for his country, although my heart sank for my hero Ron Clarke, who had achieved so much throughout his career, but was always to be denied first place in a major championship.] The 5000m: incredible that Kip Keino should be beaten; the wonderful sight of two Scots battling for supremacy (but once again, I was secretly supporting the second man, Ian McCafferty – could he not have maintained his sprint rather than, apparently, easing over the line behind the skinhead Anglo-Scot, Ian Stewart, who battled every step of the way to victory?) The marathon: Ron Hill’s white string vest ‘miles’ in front, setting a European Record, topping the 1970 world rankings and probably running the fastest marathon ever, over a properly-measured course. But what I remember most is the head-shaking exhaustion of our Scottish hero, defending champion Jim Alder, as he struggled for breath and forced himself round the track to salvage a silver medal, while young Don Faircloth of England swiftly pursued him to finish only fifteen seconds behind and win bronze. However I also possess a copy of ‘The Victor’ comic, which was published at the very same time, to read that the winner of the CG marathon in Edinburgh was actually Alf Tupper, who set a new British record after eating a big bag of chips at half-way! There were only cheers for every competitor from every corner of the Commonwealth – no insults or booing. It was friendly, enthusiastic and the greatest of occasions for spectators. Athletes who were determined to take part and tried to fight through injury received only support and sympathy. Rainbow memories. Although I have been a spectator at one European Indoor Athletics Championship (1974, in Gothenburg, Sweden) and the three International or World Cross-Country Championships held in Scotland (1969 Clydebank; 1978 Glasgow; and 2008 Edinburgh) I have never bothered to travel to the Olympics. Too much hassle; better on television; and anyway, it could never compare to Edinburgh 1970! My son Stuart nominated me to be a “batonbearer” and I was accepted, possibly because I had been a “running role model” for many years in Aberdeenshire, as a fairly successful Scottish distance runner and a secondary school teacher who had advised young athletes. The whole nature of the event had changed drastically (as had society, during the previous 44 years). Now the relay was meant to be a way of giving towns and cities across Scotland a taste of the Commonwealth Games and celebrating local folk who had contributed to their communities in a variety of ways. Most of the 4000 selected had been long-time coaches or charity workers, and as a selfish old runner, I felt rather unworthy. A package arrived, containing my uniform – a tasteful white, blue and yellow tee-shirt and startlingly bright ‘heritage blue’ trousers – plus detailed instructions. On Sunday the 29th of June I should report to Duff House, Banff, at 1 p.m., bringing my passport to confirm identity. The short stretch of path assigned to me would be just before Duff House (nothing to do with Homer Simpson’s favourite beer, but a lovely Georgian building set in parkland). Hmm! Hard not to be just slightly cynical. So how did it pan out for me? Well I must say that every QBR team member I met was cheerful, helpful and friendly. The other three batonbearers in my shuttle bus were the same, and we had a good laugh as we waited for the convoy to arrive from Turriff – 20 minutes late. I was concerned to notice that my companions were wearing box-fresh pure-white trainers, whereas I had only shoved on my favourite old running shoes – just as well these had been sprayed with deodorant! Motivating music boomed out, including Bruce Springsteen’s ‘Born To Run’ and the Proclaimers ‘500 miles’ – ironic or what? Our section was heavily wooded, which made the live BBC coverage fail to transmit at times. The previous runner had to negotiate quite a few speed-bumps, which I was glad to avoid, because of my dangerously ground-scraping shuffle. I was delighted that Stuart and Andrew, two of my three sons (the other one having the thin excuse of living in Sydney) had driven up from Aberdeen, along with our friend Alex, and plenty of photos were taken, along with a rather funny shaky mini-video of me plodding slowly but happily along for an arduous minute over what was barely 150 metres. There was a bit of a crowd, that seemed to be enjoying the odd spectacle, and Duff House made a splendid backdrop as I passed the baton to the next man. 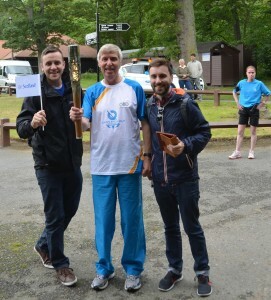 In fact, the brief Baton bearer experience was indeed fun and will make a pleasant humorous family memory.